Whole grain bread is a whole food. 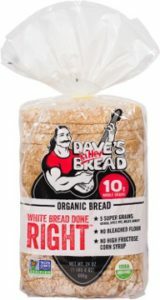 A quick look at Dave’s Killer Bread 21 whole grains and seeds nutritional panel shows a food that is low in saturated fat (0g), a good source of dietary fiber (3g), and a good source of manganese (25%). 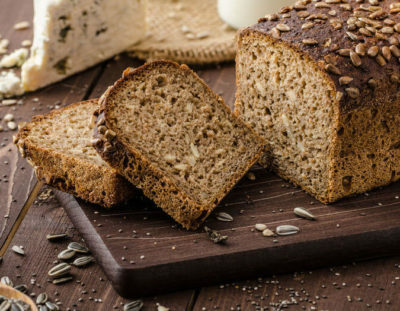 Let’s take a look at the benefits of eating whole grain bread and the nutrients found in them. What are the benefits of low saturated fat? Saturated fat can be recognized by its ability to stay solid at room temperature. Think about coconut oil, butter, and lard – they are all solid when left on the counter. Those are the obvious examples. Saturated fat can be kind of sneaky when it comes to processed foods. Aside from being incredibly tasty, pizza,bacon, donuts and ice cream are high in saturated fat. So, what is the big deal? Why is the American Heart Association against fun foods? It comes down to a pretty major disease known as heart disease. Heart disease is the number 1 cause of death in the US. According to the Center for Disease Control (CDC), 614,348 people died from heart disease in 2014. And 23.4% of all deaths were from heart disease. What does that have to do with whole grain bread? Well, decades of scientific research have proven whole grains can lower your “bad” cholesterol and lower your risk for heart disease. Eating foods that are low in saturated fats can give you a 23.4% better chance to live to 101. You have probably heard that we all need to eat more fiber. 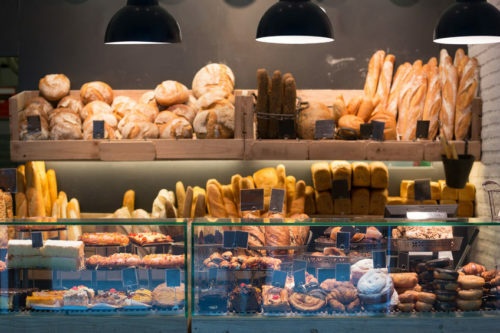 Whole grain breads that contain at least 3% dietary fiber can positively affect your health. Did you know that eating high fiber foods can make you feel fuller longer? This is because the fiber slows the rate that sugar is absorbed into the bloodstream. This slow absorption keeps blood glucose from spiking then falling rapidly. That feeling of hunger is due to rising and falling glucose triggering us to overeat. Foods high in fiber also keep your intestines working properly. Think of fiber as an internal loofa! It cleans bacteria and waste buildup in your intestines reducing the risk of colon cancer and keeping you regular. Forget about those new cleansing diets where all you do is drink juice; a few slices of whole grain bread with your favorite spread will help you go with the flow! 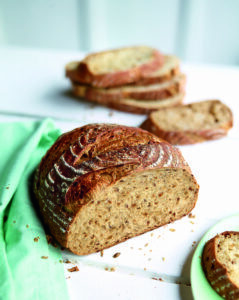 Whole grain bread is full of essential minerals. What makes minerals essential? All that means is that your body requires these workhorses to continue to function. Essential minerals are categorized by how much our bodies need. You are probably most familiar with the macro minerals: calcium, phosphorus, magnesium, sodium, potassium, chloride and sulfur. However, there are also important trace minerals our bodies require such as iron, manganese, copper, iodine, zinc, cobalt, fluoride, and selenium. Manganese is a mineral needed in trace amounts by our bodies. Manganese is found in the bones, liver, and kidneys. It is an essential part of many important enzymes involved with energy production, bone and ligament formation, protein and fat metabolism. More study is needed to fully understand how this trace mineral help our bodies function, but researches have learned that deficiencies in manganese can result in arrhythmia, epileptic seizures, abnormal bone, cartilage and disk degeneration (Campbell 2001). How can you get whole grains in your diet? Whole grain bread provides some pretty great health benefits when eaten as part of your diet. Aside from the benefits of low saturated fat, being a great source of fiber, and containing many essential minerals it is incredible versatile. You can eat it with an endless selection of toppings from sweet to savory or just toasted with some butter. Campbell, J.D. “Lifestyle, minerals and health.” Medical Hypotheses 57.5 (2001): 521-531. Nutritional panel for Dave’s Killer Bread 21 whole grains and seeds. 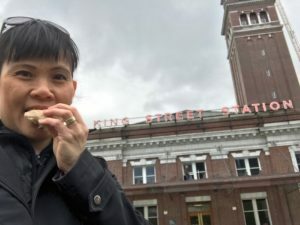 Someone said that to me today, to which I replied, “I wish, but don’t you think free bread is payment enough?” I mean, could I not be more thankful than eating the thing that I love the most at no additional cost to me! A loaf everyday? 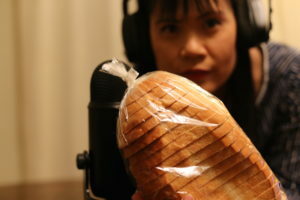 Honestly, no one needs to pay me for eating their bread, or to get a feedback on it. If you’re in this industry baking bread, I know you do it out of the good intention of your heart. I’ve met all kinds of bakers through the years, and the most passionate of all of them are the bread bakers. They know the art, the science and how hard it is to truly bake bread and make a successful business out of it. Bread bakers are the most hardworking food manufacturers in the world. With every bite I take from a bag of bread, I am truly thankful for their product that makes it all the way into our homes. Nobody needs to pay me for saying this. Dave’s Killer Bread Cinnamon Raisin Remix Bagels. Returning to Derek’s Spanish Inquisition yesterday, where he said I was overdoing it: well, maybe. Even my mom tells me I’m overdoing this diet. “No rice? Are you crazy?” She shakes her head in disappointment as I skip her very special Singaporean sambal fried rice. I feel the need to push this needle on eating as much bread as I can, so that I can persuade people on the fence that bread is safe to eat. There are too many people falling onto the other side with all the misinformation. I need to make this information available so that that they can make an informed decision on the types of diets they go on. Derek also said that a high carb diet is hurtful to people, together with that much gluten. Eating a high carb diet will not kill you (unless you are diabetic, you should stay away from a diet like this). It gives you plenty of energy to burn fat, and it reduces your cravings. Together with an active lifestyle (mine is about 35 mins of exercise everyday), a high carb diet is beneficial to maintaining weight. Eating a total of 2 oz of gluten per day (there is about 2 tablespoons in a pound of bread) will not suddenly make you allergic to gluten. That is much less protein, than most paleo or keto diets, and much safer because it is a plant-based protein. 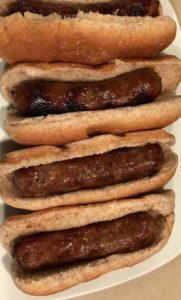 Honestly, many dieters are downing bacon, hamburgers and sausages in larger quantities, and they are definitely not developing allergies to pork anytime soon. This is not to mock people who are celiac or have gluten intolerance, but to provide the fact that gluten is a protein. Like any other protein in a normal active person, it doesn’t get preferential treatment nor is it singled out during digestion as a more problematic protein to digest. Gluten is a safe plant-based protein, and you should not be threatened by it. I can go on and on about how bread can be part of a healthy diet. I hope bread companies can use the information that I share here to educate people on how safe eating bread can be. In addition, I’m not just one data point. I am an example of utilizing the information science has given me to help me guide my diet. Use Science. It will make you love bread and carbs again. I received a handful of Dave’s Killer bread today. In their new line of organic bagels, the Epic Everything and Cinnamon Raisin Remix bagels are seriously awesome. Haven’t tried it? Well, true to their brand, they delivered. Packed with 27 g of whole grains and 12 g of protein in each bagel, these bagels were epic-ly delicious! Strawberry cream Cheese with the Cinnamon Raisin Remix bagel. Grilled Mozzarella Cheese on 21 Whole Grains and Seeds. Fried Egg and Cream Cheese on an Epic Everything Bagel. Honey Oats and Flax French Toast with Maple Syrup and a side of bacon. When Holista Foods sent in their paleo bread, I was puzzled. 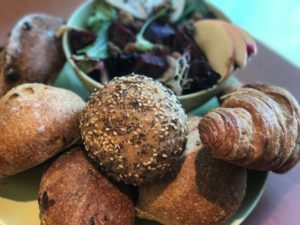 Why make bread that has no grains? I don’t understand. So I did some research. Simply put, it emulates the diet of our hunter-gatherer ancestors, and it advocates consumption of unprocessed animals and plants, including meat, fish, eggs, vegetables, fruits, nuts and seeds. I don’t know where bread fits into this diet. If you study the diet itself, it gets boring after a while, and there needs to be a carrier for all these fish, meat and eggs. Paleo bread from Holista Foods. Therefore, someone created the paleo bread, using a flour blend of coconut, almonds, seeds and eggs. It is a difficult bread to make, so hats off to Holista Foods who makes it possible to make a great tasting product! 100% Whole Wheat from Oroweat®. I was on the go again today, baking at the Wheat Marketing Center and making it to meetings. My pile of sandwiches was packed into the bread bag and went with me wherever I went. It’s Day 11 now, people around me should be comfortable with me eating bread and talking at the same time. Today’s bread of choice is Oroweat® 100% Whole Wheat. 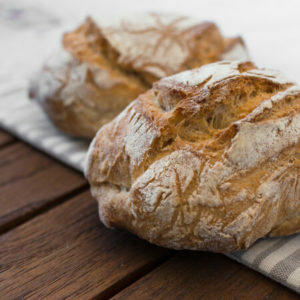 I love whole wheat bread because it is made from whole wheat flour. Yes, the whole wheat! Many have forgotten that the wheat grain is one of the world’s most nutritious grain. It is an excellent source of dietary fiber, minerals, vitamins, and highly bioactive phytochemicals, which are antioxidant compounds that fights cancer. We are truly lucky to have wheat grow in abundance in America, yet it puzzles me why there are so many people who are anti-wheat these days. Besides providing excellent nutrition, whole wheat has many benefits like reducing the risk of obesity, type 2 diabetes and cardiovascular diseases. With so much research showing whole wheat flour as a super food, I want to bring awareness that this can be taken advantage of by consuming whole wheat products like this 100 % whole wheat bread.